Customers report Yellowfin BI Leads in Project Length, Project Success, and Business Value, according to The BI Survey 17 from BARC. Yellowfin BI placed first in four categories, and was considered a leader in eight categories of the The BI Survey 17 from BARC. The BI Survey is the world’s largest and most comprehensive survey of business intelligence end users. BARC declared Yellowfin the top vendor across different peer groups for Project Length, Self-Service, Ease of Use, and Operational BI. Additionally, Yellowfin ranked as a Leader for Project Success, Business Value, Price-to-Value, Mobile BI, Cloud BI, and Innovation, scoring well above the peer group averages in each category. On top of leading Project Length and Project Success categories, Yellowfin was named a leader in all peer groups for Business Value and Price-to-Value with an 8.9 and 9.7 respectively. BARC is an enterprise software industry analyst delivering product evaluations, conferences, market research and consulting to over 1,000 customers each year. BARC specializes in advising organizations on software selection in its core research areas of BI, data management and enterprise content management. The BI Survey 17 features a range of different types of BI tools so we use Peer Groups to help identify competing products. The groups are essential to allow fair and useful comparisons of products that are likely to compete. The Peer Groups have been defined by BARC analysts using their experience and judgment, with segmentation based on two key factors: the usage scenario and the regional focus. All BI companies can tell customers what happened. Yellowfin tells them why it happened. Yellowfin is a global Business Intelligence (BI) and analytics platform dedicated to solving real enterprise analytics challenges, and helping business people understand not only what happened, but why it happened. Founded in 2003 in response to the complexity and costs associated with implementing and using traditional BI tools, Yellowfin is a highly intuitive, 100-percent Web-based reporting and analytics platform. More than 25,000 organizations, and more than three million end-users across 75 different countries use Yellowfin every day. 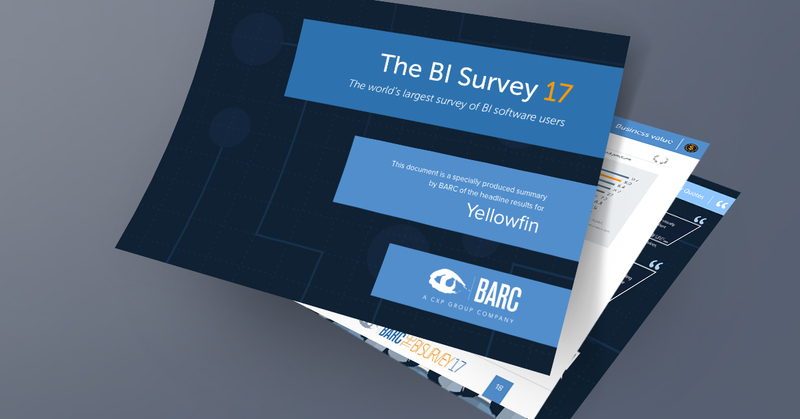 For more information on Yellowfin’s results in The BI Survey 17 from BARC, visit www.yellowfinbi.com/BARC-Survey17. For more information about Yellowfin BI, visit www.yellowfinbi.com.